The Southern California Indoor Volleyball Hall of Fame (SCIVBHOF) located inside the Sidelines Café at the American Sports Centers in Anaheim where the USA National Teams train for Tokyo 2020, is open free to the general public to see some of the great history of the sport during the week and selected weekends throughout the volleyball season and summer. Going into year three with the next induction scheduled for May 5, 2019, the HOF features display walls for the two years of inductees, plus the donors and sponsors that have contributed to the 501c3 non-profit being viable in supporting the indoor sport from San Diego to Santa Barbara. The walls also feature the biographies of each of the inductees and a special plaque for the SCIVBHOF Lifetime Achievement Award. 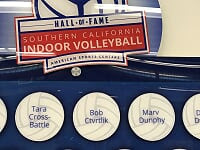 The HOF now has an updated website at www.socalindoorvolleyballhof.com and Facebook page, plus a YouTube channel that features the 2017 and 2018 HOF induction videos produced by the Arizona State Cronkite School under Tom Feuer. “We are looking forward to announcing our year three finalists in September and the 15 HOF inductees in January for the May 5 event,” added Sondheimer.